De La Hoya Says Deontay Wilder Is A Heavyweight Thomas Hearns! By James Slater: Fans have been waiting, and waiting for promising, talented heavyweight contender/prospect Deontay Wilder to step it up in terms of quality of opposition, and now, in speaking to Ringtv.com, Golden Boy head Oscar De La Hoya says that this is just what he plans to have “The Bronze Bomber” do next. So far, aside from the odd decent opponent, the 26-year-old sole American boxing medallist in Beijing has fought guys Gene Wilder could defeat – but all that has now come to an end says De La Hoya. “The plans are that it’s time to step him up,” Oscar said to Ring.tv. “It’s time to take him to the big stage – the HBOs and the Showtimes. It’s time to unleash Deontay Wilder, and he will be a serious, serious threat to the heavyweight division. Wilder, 24-0(24) has certainly got punching power, and hand speed, and a tall (6’7”) athletic build. But due to his poor opposition, we have no real idea how good the Tuscaloosa man really is. Or how good he can become. Last time out, in halting the sometimes dangerous Kertson Manswell inside a single round, Wilder took a tiny step forward, but after four years as a pro and after well over twenty fights, it’s time for at least a top-20 guy, maybe even a guy just outside the top-10. It is with open arms, then, that we take De La Hoya’s news. Wilder has recently called out Tyson Fury (in fact he re-called him out) and that would make a cracking HBO heavyweight fight. But don’t hold your breath on that match-up taking place any time soon. So just who could Wilder be “unleashed” against? 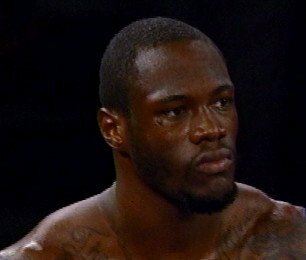 Wilder is staying active and he seems to mean it when he says he believes he is the best heavyweight puncher out there. What we need now is proof. Let’s hope Wilder gets in there with a Ruslan Chagaev, an Alexander Dimitrenko, a Kevin Johnson or a Tony Thompson soon. Either one of these fights would be a great test for him, maybe even worthy of being aired, as a supporting bout, on HBO or Showtime. De La Hoya is paying Wilder a massive compliment by even mentioning his name alongside that of the awesome Tommy Hearns, but Oscar is also putting added pressure on the young heavyweight’s wide shoulders. We all want to see if Wilder can live up to the hype. You are here: Home / Boxing News / De La Hoya Says Deontay Wilder Is A Heavyweight Thomas Hearns!